This partnership agreement is suitable either for the establishment of a new partnership or for formalising an existing partnership. It deals with partnership capital, profits and losses, drawings by partners, conduct of partnership business and decision-making including provisions relating to deadlock. You need this contract if you want to establish a two-person partnership, or formalize an existing partnership, and want to set out your relationship to the other parties, your mutual obligations, and the rules governing the conduct of your partnership. For Guidance and info on using Partnership Agreements see our blog article. There must be a partnership deed executed by the partners prior to formation of the partnership. The PA governs the relationship unless there is a partnership deed. The partnership deed needs to be registered with the Registrar of Firms of the state in which the principal office of the partnership is situated. A partnership does not have a separate legal personality apart from its members in a way that a limited company does. As a consequence, the partners are jointly and severally liable for the obligations of the partnership i.e. each partner can be sued for the full amount of any liability of the partnership. There is no limit on liability. These arise from the partnership agreement, where there is one. In addition, partners are agents of the firm and their other partners. They also have a fiduciary relationship to each other – e.g. a duty to account and disclose information concerning their activities in relation to the partnership. Each partner has the power to bind his partners and make them liable on business transactions which are carried out in the name of the partnership. While this power can be limited internally, if the internal agreement is breached, the partnership might still have a liability to a third party who entered into a contract in the belief that they were contracting with the partnership. Yes, a deed is mandatory for a Partnership to come into effect and to clarify and define the relationship between the Partners. 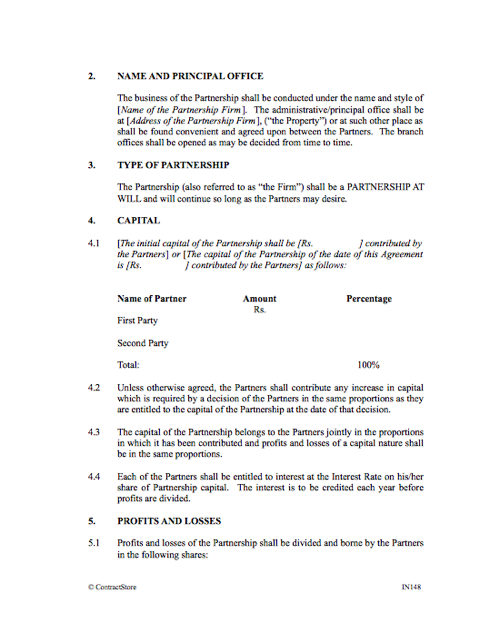 The date to be inserted on page one is the date on which both the partners have signed and executed the Agreement. The full names and permanent address of both partners should be inserted on Page one. There are various details to be inserted here including the date to which the annual accounts are made up, and a brief description of the business. The interest rate to be inserted is the rate of interest payable on partnership capital by the partnership to the individual partners. Since partners frequently raise capital by borrowing from a bank, it is usual for the interest rate under a partnership agreement to be slightly more than the rate which each partner has to pay to his bank. In clause 2 the name of the business is to be inserted and the head office address should be inserted. This type of partnership depends upon the will of the parties to terminate the partnership, by giving a simple notice of termination. This type of partnership is for a specific time period that the partners may agree upon. This is a partnership for completing a specific project or work, where the parties get together only for a specific task. 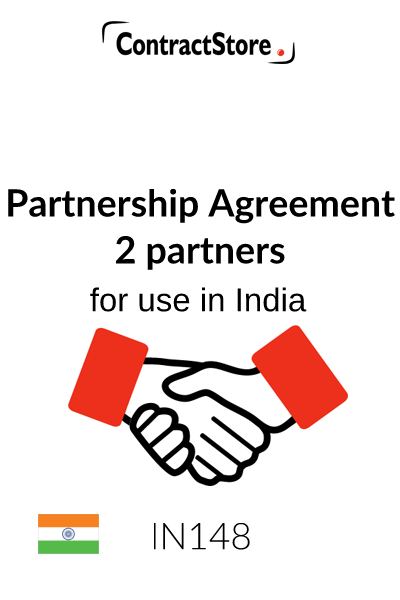 This template refers to a) as it is the most usual form of partnership in India. Partnerships are registered in a selected State and appropriate stamp duty has to be paid in the state where the Partnership is to be registered. In this clause the amount of capital which each partner has to contribute should be inserted. The percentage contribution of each partner is also shown, since this can be relevant if percentages are used in relation to voting rights which may be set out in the deed or governed by the PA. Clause 4.2 makes it clear that any additional capital is to be contributed in the same proportions as the initial capital, and clause 4.3 underlines this. Clause 4.4 deals with the entitlement of the partners to receive interest on their respective shares of capital. It is usual for profits and losses to be shared in the same proportions as the capital contributions but this is not always the case. The percentage share of each partner should be inserted in clause 5.1. Under clause 5.2, if there are any expenses which the partners might incur but which are not to be treated as expenses of the partnership, then some adjustment to clause 5.2 might be required. It is usual for partnerships to arrange that each partner can withdraw a regular monthly amount on account of his share of profits, similar to a monthly salary. This clause deals with this matter, and makes it clear that if there is not enough money in the account, drawings cannot be taken. Similarly, any partner who withdraws more than his profit share for a year must immediately repay the surplus. Drawings referred to in this clause differ from the remuneration in clause 13 which is required primarily for tax purposes. This clause contains a reference to the possibility of one or both partners making a loan to the partnership and in that case, interest at the agreed rate set out in Clause 1 will be payable. Clause 7.2 provides that a loan must be repaid on notice – six months is suggested in our clause. In practice, if a partner does make a loan to the partnership, it would be sensible to have a separate loan agreement dealing with these issues in more detail. ContractStore has some loan agreement templates. This is one of the most important clauses as it deals with the day-to-day management of the partnership, and how decisions are arrived at. Clauses 8.1 and 8.2 deal with frequency of meetings and who may call a meeting. Whereas in partnerships of three or more partners it is prudent to identify those matters that require the consent of all partners and to distinguish such matters from those that may be agreed by a majority of partners, this is usually inappropriate and impractical for a partnership of two partners. Thus clause 8.3 requires all matters relating to the partnership to be agreed by both partners. If one partner is to have decision making authority on certain issues the wording would need to be adjusted to deal with this. In addition to considerations of practicality, under the law, individual partners have joint and several liability, i.e. a debt incurred on behalf of the partnership by one partner can result in either of the partners becoming liable to the creditor for that debt. Unanimous agreement therefore gives protection to both partners. Clauses 8.4 to 8.6 deal with the procedures relating to meetings and decision making. This clause sets out some general obligations on the partners – to devote all their time to the business, to promote the interests of the partnership etc. If either of the partners is only involved on a part-time basis, or if a partner has an interest in another business, then appropriate wording should be inserted to make it clear that the particular circumstances are acceptable to the partnership. Following on from the previous clause, clause 10 imposes a number of specific restrictions on partners: serious harm can be done to a business if one of the partners, without any consultation, makes commitments to third parties. This clause is intended to avoid those risks. The name and address of the bank should be inserted in clause 11.1. The signing arrangements are dealt with in clause 11.2. This clause provides not only for proper accounts to be maintained but also for a balance sheet and profit and loss account to be prepared each year. The firm’s external accountants will prepare the annual accounts which will be signed off by the partners. Adequate provision for reserves, etc, will normally be agreed on the recommendation of the accountants and this topic is covered by clause 12.3. Remuneration given to the partners need to be inserted here. This clause is very important from the income tax point of view since there is a deduction for remuneration of the partners from the taxable income which decreases the tax liability. The remuneration of the partner cannot exceed the limit given in this clause. Therefore due precaution should be taken before fixing the remuneration, taking into account the sale forecast etc. This Clause sets out the key duties of the partners to ensure the effective running of the partnership. The term “hundies” in 14.3 refers to financial instruments that evolved on the Indian sub-continent and are used in trade and credit transactions. In India business organisations often need to interact with the public sector and hence the references in Clauses 14.4-14.8 inclusive. Clause 14.9 selects arbitration as the resolution method in the case of disputes – also see clause 17 on this point. This provision deals with the termination of the partnership as a result of retirement or death. It provides for the continuation of the partnership through succession which is common in India. Provisions for dissolution are not required in an Indian partnership agreement as there is a dissolution deed made at the time of dissolution in India. The formalities required for giving notice under the Agreement are dealt with here. This clause sets out the process to be followed in the case of a dispute and refers to Arbitration as the chosen method. Clause 17.2 confirms the application of PA. Also, the state in India which has jurisdiction in relation to the agreement needs to be inserted. This will usually be the state in which the principal office of the partnership is situated. This clause makes it clear that any previous agreements or other arrangements agreed between the partners are of no effect once the Partnership Agreement has been signed. A “Boilerplate” or back up clause which deals with the possibility of one of the terms becoming invalid for some reason. That will not affect the validity of the rest of the Agreement. This is another “Boilerplate” provision, which makes it clear that if one of the partners is let off the hook even if he has committed some breach of the Agreement, that will not prevent the other partners from later taking whatever action is allowed under the Agreement. Each partner should sign the Agreement in the presence of an independent witness. Assuming each partner wants a signed copy, two copies of the Agreement in its final form should be prepared and signed by both partners and witnessed. A deed is a document that is legally binding even if there is no consideration. Whereas a deed used to require the seal of the signatory to be affixed s nowadays all it requires is an independent witness who should sign after the signatory and then add his/her address and occupation. The same individual can witness more than one signature. 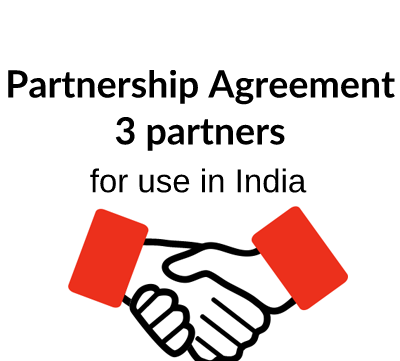 The partnership deed needs to be registered with the Registrar of Firms of the state in which the principal office of the partnership is situated. With regard to feedback for the service and product, I could not be happier. I spoke with Giles who obviously knew exactly what he was talking about and instantly directed me to the document which will fulfil my requirements and more. Both the searching facility and payment system were quick and easy the document I chose included clear instructions meaning I spent very little time adjusting the document to my needs.